A leading international elastomeric solutions provider recently introduced a new Spanco Workstation Jib Crane to their newly expanded production facility. The company is known for their expertise in applied engineering, and their products are used in a range of industries including imaging, motion control, industrial and commercial, transportation, and infrastructure. The company has facilities all over the world—from Shanghai, China to Manheim, Pennsylvania. Their Manheim facility has expanded multiple times to include more than 50,000 square feet of production space. With increasing demand for their products, Facilities Engineer Paul Austin began another expansion of their factory this year, which will be used partially as a machining center for metal shafts and rollers. Once the newly expanded facility neared completion, Austin decided to reach out to a local distributor for a material handling solution that would help workers move metal shafts in and out of their CNC machining area. However, the setup of their new facility presented some unexpected obstacles. After visiting the site, the third-party distributor recommended a wall-mounted workstation jib crane from Spanco. The new facility needed a material handling solution that was lightweight, fast moving, and capable of transferring repetitive loads quickly and easily. Their ceiling didn’t allow for much room overhead, and with multiple other overhead obstructions, installing an ergonomic crane with the appropriate headroom was essential. Spanco’s low profile steel track provides greater use of ceiling-space and increased clearance above and below the boom. 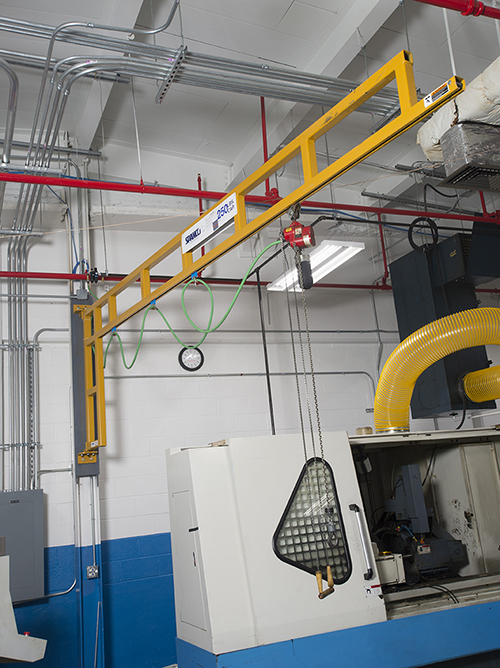 The workstation jib crane from Spanco is wall-mounted to free-up production floor space and keep the facility as lean as possible. The 250-pound capacity system includes festooning for the air hose, which makes lifting and transferring metal rollers and shafts much easier for workers in the machining center. The system’s enclosed track prevents dirt accumulation inside the tracks and maintains end truck and trolley alignment to ensure smooth, easy movement. The sturdy trussed track permits a 16-foot span, which covers multiple machining centers within a 200-degree circular coverage area. Workers at Fenner Precision will soon be using the new system on a daily basis to lift and transfer metal in and out of the machining center safely and easily. Fenner Precision’s Facilities Engineer Paul Austin is very happy with the outcome of their new Spanco Jib Crane, explaining that he’s been very impressed with the quality of the product, shipping time, and ease of installation.